Have you noticed the current trend of placing candle chandelier in the room to give it a rustic look? It does look lovely and charming when placed over the dining table. If you are not comfortable placing real candles on the plank, then consider placing electric ones. In this blog post, we are going to show you the trick of making your very own chandelier in a few easy steps. Grab a piece of plank from the local hardware store to use it as the base of the chandelier. Make sure the breadth and the length of the plank complements the room’s dimension. If you plan to keep it over your dining table then choose a size that suits the table’s size. Spray the wooden plank to a color that matches the rest of the room’s décor. Now pull out your hammer screwdrivers set and attach the four hooks on each side of the freshly painted plank in order to attach the four chains to it. 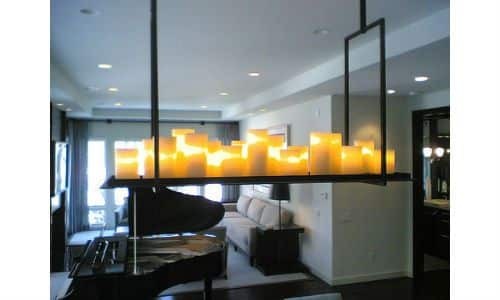 Now firmly put the Versa hooks in the ceiling that will hold and hang this candle chandelier by the chains. Finally, place real candles or electric candles of various heights on top of the plank to give it one final touch. How do you like this diy project? Do you plan to take it up soon?